He sailed some forty years ago from the green old Irish shore. Joint ahead and center back and Jerry go oil the car. And while the boys were shimming up the ties, sure Jerry would be oiling the car. “Joint ahead and center back,” were the very last words he said. For this month’s Lost Forty Project song arrangement and video, Randy Gosa and I worked up this song from the repertoire of Minnesota singer Michael Cassius Dean. I wrote about “Jerry Go Oil the Car” in Northwoods Songs in November 2012. Together with last month’s song, “To Work Upon the Railroad,” it is one of five railroading songs/recitations in Dean’s known repertoire. 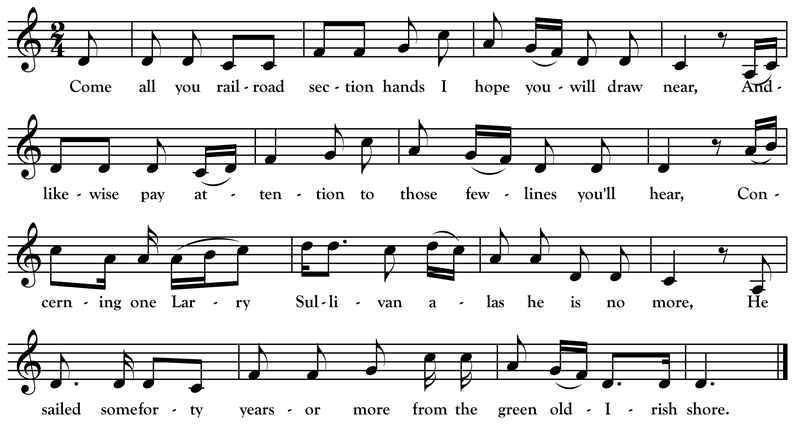 The others are “O’Shaughanesey,” “The Arkansaw Navvy” and “The Grave of the Old Section Hand.” The transcription above is my version for which I pared down Dean’s text a bit and used a melody based the 1924 cylinder recording of his singing. Since writing about this song back in 2012, my research has revealed more on Dean’s personal connection to railroading. Dean wrote that he “gathered up” his repertoire in his “wandering around on the Lakes and in Lumber Camps and Rail Road Construction works.” Though I have yet to find evidence that he worked on the railroad himself, Dean ran a succession of saloons across the street from the St. Paul and Duluth depot in Hinckley where he catered to (and perhaps swapped songs with) railroad men employed by the St. Paul and Duluth line in the 1890s. He was the oldest conductor in the point of service, on the Milwaukee road, having been employed on the railroad for forty-nine years,… Mr. Dean has never h[a]d an accident in which a person was killed through his long term of service, although he himself has had many narrow escapes when the railroad equipment was inferior to that of today. …Railroad men in this city were greatly depressed when they heard of his death as he was one of the most popular railroad men on the system and was regarded by other trainmen as a man of good luck because he never had an accident in so many years of service. For the above video, The Lost Forty performed our arrangement of this song at the Minnesota Transportation Museum aboard an actual “drover’s coach” built in the 1890s. Dean, Michael C. Michael C. Dean to Robert Frothingham, September 16, 1922. Letter. From American Folklife Center, Gordon Manuscript Collections. “Oldest Conductor Dies Last Night,” Janesville Daily Gazette (Janesville, WI), June 2, 1910.